MGH physician C. Miller Fisher, MD, is renowned for his work on lacunar infarcts, carotid artery stenosis, atrial fibrillation, and transient ischemic attacks ("TIAs" or "little strokes") that often precede a permanent stroke. Dr. Fisher started his career at the Montreal Neurological Institute. 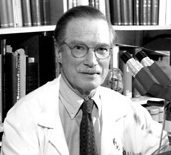 After taking up a position in 1954 at Harvard University and the Massachusetts General Hospital, he continued his research on the cerebrovascular system and was able to show that patients in danger of suffering strokes often first experienced short periods of reduced consciousness, due to partial blockage of arteries in the brain, known as transient ischemic attacks. Dr. Fisher proved, by a series of pathological studies, the relationship between stroke and the formation of blood clots in the heart in patients with atrial fibrillation. He also showed the relationship between stroke and carotid artery stenosis, which made preventive surgery possible and greatly reduced the incidence of subsequent strokes. Many of Dr. Fisher's former students, who now run laboratories and clinical programs throughout the world benefited greatly from his original teaching principles. For more on Dr. Fisher, visit the Canadian Medical Hall of Fame web site, or view a historical video of his accomplishments. Dr. Raymond Adams is the former head of our Neurology Department and one of the founders of modern neurology. He became the Chair of Neurology in 1951. Dr. Adams is renowned for his work on basilar strokes and hypoxic-ischemic encephalopathy after cardiac arrest. (Above) Dr. Raymond Adams standing at a podium, in the midst of one of the many lectures he gave during his time at the Massachusetts General Hospital. The Raymond Adams Fund for Clinical Research was established in late 2002 by a generous donation from an anonymous, retired neurologist who trained under Adams. The funding goal was ultimately met through the generosity of Adams' trainees, which include more than 200 Professors across the US and around the world. Drs. Fisher and Adams worked closely with Dr E. P. Richardson, the Chief of Neuropathology at MGH.